Vittoria Corsa G Tubulars... or the rubber that keeps us grounded. If you follow the Affinity feed then you'll know well that we love Vittoria tires. Why you may ask? Well this post will pretty much clarify and also give you some insight which you may not have previously known. For Affinity and our team riders, we ride the Corsa G competition in both clincher and tubular depending on the day to day usage. Typically our track wheels are tubular, although for the most part the clinchers roll and feel pretty much the same. Both the tubbies and clinchers have 320 TPI (threads per inch) and like a fine suit the higher the thread count the better the tire. Higher TPI means the tire will feel more supple on the road and since the thread count is high it'll also be less prone to flats. A double win in our book. The Corsa's (and most Vittoria tires) also feature Graphene... what's Graphene? Basically it's an extremely thin sheet of carbon fiber which has a host of advantages including better rolling resistance, better cornering capabilities and it gives the tire more grip. Overall the Corsa's are one of the best all around performance tire, we use them year round on the road, and track (whether wood, or asphalt)... hell we even train indoors on them! 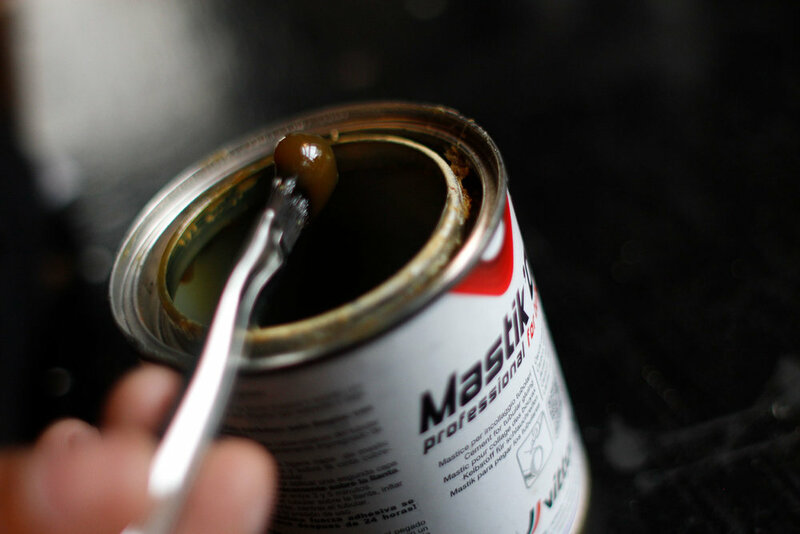 Lastly, we want to comment on the Vittoria Mastik glue... it's pretty much a staple for track racers, it's super tacky and ensures you'll never roll a tire. Enough said, basically it's an industry standard in our world. Oh the best part, they come in gum wall and anthracite... thank you Vittoria for making the tire of our dreams. Deluxe Cycles 80mm Carbon rims/wheel build Part 1. In the world of after market bike parts there's companies that are the standards in industry... they're the staple products you buy if you're building up a quality build. Aside from the industry leaders, it boils down to following the market and figuring out those niche companies that introduce product that just nail it on the head. What we have here is the best of both worlds with this Deluxe Cycles carbon wheel set... read on but first enjoy this picture set. Deluxe Cycles is that new niche company, and their carbon rims are at the top of their game compared to their highest end counterparts (IE: ENVE, FFWD, ZIPP etc.). Bang for your buck you'd be hard pressed to find a better deal... they're $360 per rim. 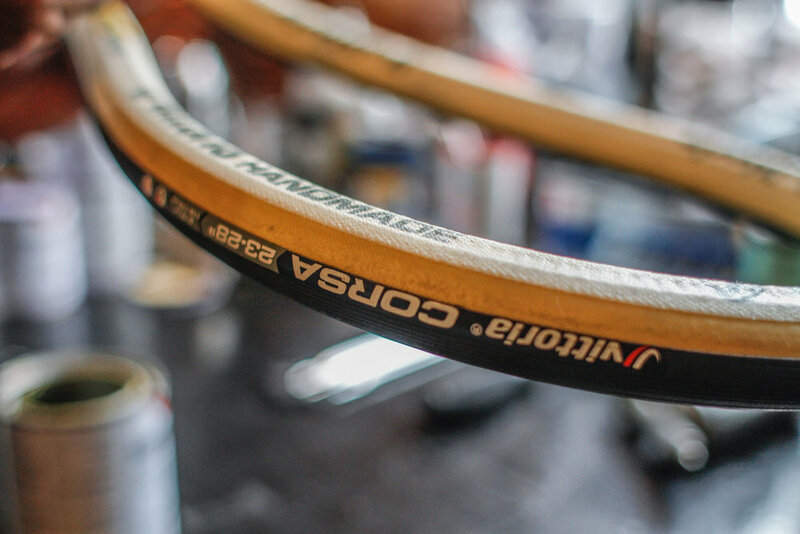 I'm running the Deluxe 80mm tubular track rims laced to the Phil Wood Pro track hubs (part 2 of the review) and my tires of choice are the Vittoria Corsa tubulars (part 3). These 80mm beasts are stiff and super thick, a proprietary feature for an otherwise non proprietary mold rim... this is what sets the Deluxe rims apart. With cheap carbon rims you can simply push the rim in with your fingers as if there's very few layers of carbon, the Deluxe rims are NOT that type of rim. They feel thick and solid especially in the center of the rim where there's usually less carbon. These rims are perfect. The track rims come 28 hole, meaning they're true track rims... when ripping on a banked track, every bit of stiffness counts and 28 hole is where it's at. Finally, the rims are the modern standard 23mm wide... wider is better and the 23mm wide, with 23mm wide Vittoria Corsa Tubulars feel awesome and handle like nobodies business. Overall the rims just feel right... they're responsive, affordable and yep look really nice with the matte finish and black glossy decals. For more info hit up Deluxe Cycles and cop a pair of these trick carbon rims. Stay tuned for part 2 review of this Deluxe Carbon wheel set... what better way to top off a quality wheel build but with a pair of Phil Wood Pro track hubs. Erin rolls tubulars... on the track. What's your Affinity? Dude pick a side. Buy a T shirt and rock it proud... choose wisely here or here. Tubular or Clincher... how do you roll? Tubular or Clincher… pick a side. These oversized, box-cut t-shirts are made in the USA and printed in small batches in Brooklyn NYC by people who really care about their work. We know where we stand, do you? Erin loves his “tubee’s” on the track. Chris hates glue and enjoys the freedom of quick flat fixes. Wilis couldn't decide so he rocks both. $40.00 shipped in the USA, $50.00 worldwide with a pack of reflective Affinity stickers. 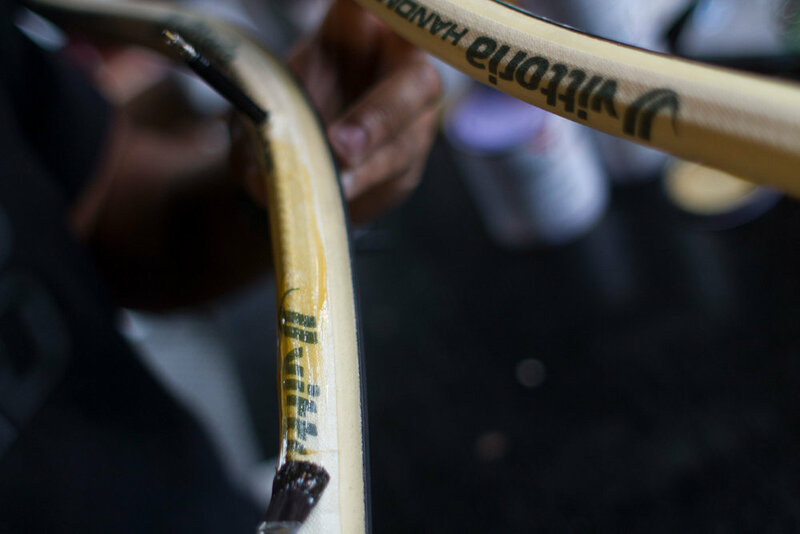 What’s your Affinity… Tubular or Clincher? Buy with pride here.